Beirut (Agenzia Fides) The Maronite Patriarch Boutros Bechara Rai intervened in the debate which reopened in Lebanese society on the legal recognition of civil marriage, and the interlocutory expressions used by him are interpreted by many as a sign of readiness to deepen the discussion without prejudice . 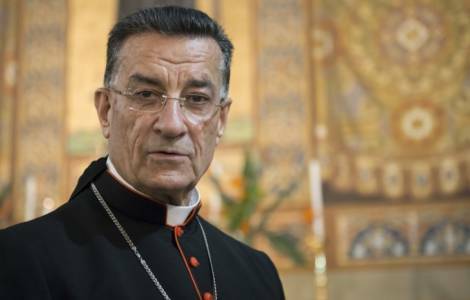 In his statements, after a meeting between the Patriarch Rai and Lebanese President Michel Aoun, the Primate of the Maronite Church reported not to be absolutely against a law that recognizes marriage as a civil bond. If civil marriage became law, then it would be mandatory for all. "We are not against civil marriage completely, but show us one law in Lebanon or in the world that is optional. Laws are binding", remarked Patriarch Rai. "If instead we introduce a mandatory law to attest and sanction the nature of marriage - and of every marriage - as a civil bond, "then it would be my duty as Patriarch - added the Primate of the Maronite Church" to explain to the Maronites, that marriage is one of the seven sacraments of the church, to be celebrated if they want to live their Christianity in an authentic way". And this is because everyone has the responsibility to make his own decisions in conscience before God, since "it is God, not me, who judges actions". Also in the past, on several occasions, Patriarch Rai - created Cardinal in 2012 by Pope Benedict XVI - had expressed his opinion in favor of a law on "mandatory civil marriage" in order to recognize the civil effects of all the Lebanese conjugal unions, regardless of the religious confession of belonging. In his new statements, the Patriarch also rejected the controversy of those who argue that Lebanese religious hierarchies oppose the legal regulation of civil marriage in order not to have to renounce the economic contributions collected to celebrate and register religious marriages. The possible approval of a law on civil marriage in Lebanon would necessarily imply an amendment to Article 9 of the Constitution, according to which the personal status of each Lebanese is regulated according to the legal provisions and practices of their own religious community. As reported by Fides (see Fides 21/2/2019) the debate on civil marriage has stirred tensions in Lebanon after the newly appointed interior minister, Raya Hassan, reignited the issue for its recognition by religious authorities. But several religious and political leaders have already expressed their opposition to the prospect of a legal recognition of civil marriage. Lebanon’s highest Sunni authority, Dar Al Fatwa, published a statement to express its “absolute rejection” of the idea saying that it contradicts Islamic law. Also Father Abdo Abou Kassem, the Catholic Church's spokesman, argued that an optional civil marriage is “wrong” and “confusing” and reaffirmed that on this point Lebanese Christians and Muslims are united, and that the Catholic Church does not support civil marriage because it contradicts the concept of the ‘sacrament of marriage. Much of Lebanese civil law, including personal status matters such as marriage, divorce and inheritance, is applied according to the relevant religious sect. Lebanon has 18 recognized Muslim and Christian sects.